Beautyqueenuk | A UK Beauty and Lifestyle Blog: Beach Essentials Giveaway! All you have to do is complete the entry form below for your chance to win. The giveaway is open for 2 weeks and it is UK only. There are some mandatory options, so please ensure they are completed or your entry will be null and void. It looks a great little bundle and I am always buying from Amazon! Because the blanket seems like it'd be good fun! the voucher would come in handy. It looks a great prize for a fun day! love shopping at Amazon, next day delivery! The twister towel looks fun and the amazon voucher would be handy to buy a book or two. oh my, that twister towel looks amazing! I'd love to win as it all sounds like so much fun! I love Amazon vouchers, and the Twister towel looks great! 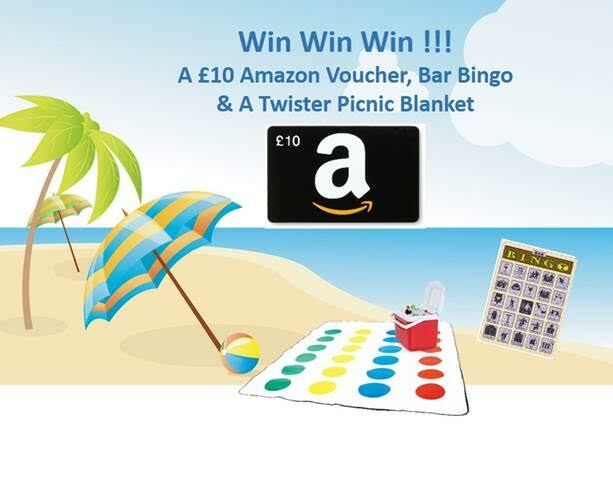 I'd like to win as the picnic blanket looks great and Amazon vouchers are always useful. Lovely Selection of things for the prize. Because i am going on holiday soon & this would be ideal. because the twister blanket looks ace! It would be great to take these on a trip to the beach. We love a good old picnic so would love to win! i love that towel so much! I've already taken a liking to the twister picnic blanket. It looks like absolute fun! Such a fun giveaway - the Twister picnic blanket is a brilliant idea! Fun with the family, would be great to win! Loving the Twister towel and an Amazon voucher would be a real treat. I would like to win because I would like to buy something nice for my house from Amazon and the beach towel is so quirky, I love it! I would love to win because picnics don't cost anything to 'enter' and the whole family can join in. If it rains, we have a picnic on the living room floor. Because the sun has finally shown itself and I want to get outside & have some fun before it disappears again.